Let’s start by admitting that this children’s book is aimed at being gross, and aimed at young boys who like to be gross. 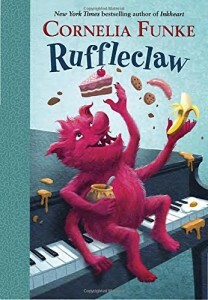 Part of me read the children’s book as if it were a parable, where all the disgusting behavior of the monster is meant to wake up something in the conscience of the reader. Is that the intent? I don’t know. However, the book succeeds in both grossing me out, and smiling at the same time, as I recognize the monster tendencies of some young children. I also think it helps defuse all the monster fears that some children have. Monsters can appear mean and ugly, but deep down they just love chocolate cake. Several things surprised me about the book. One was that my library lists it as a first chapter children’s book. I think you’d need to be a pretty good reader to make it through the vocabulary, though I could imagine some children trying. The second surprising thing, considering how well know Cornelia Funke is to readers, is that the book was originally written in German. Perhaps that explains why in some ways, the language doesn’t quite live up to her best works. I think something gets lost in translation. All in all, I agree with Amazon reviewers that it’s not Funke’s best, but if you are trying to get a reluctant boy to read some books, give this one a try.